In The Reject: Community, Politics and Religion after the Subject, Irving Goh draws upon and discusses a wide variety of twentieth-century French thinkers in order to elucidate ‘the reject’ as not only a crucial figure of thought for the contemporary world, but also as traceable throughout the course of philosophical histories. Outlining the relationship between Goh’s notion of ‘the reject’ and existing conceptions of ‘the subject’, Bjarke Mørkøre Stigel Hansen welcomes Goh’s impassioned contextualisation and defence of the reject as a textual and empirical figure as a timely addition to the literature. The Reject: Community, Politics and Religion after the Subject. Irving Goh. Fordham University Press. 2015. 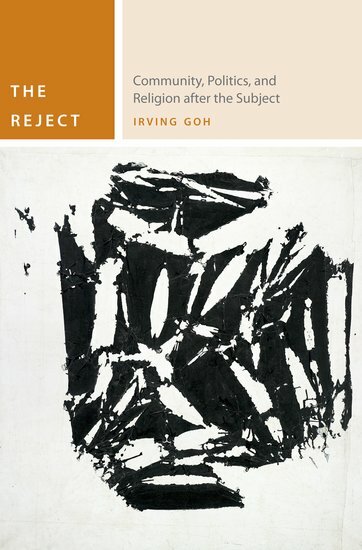 Irving Goh’s The Reject: Community, Politics and Religion after the Subject is an ambitious attempt to bring together ‘contemporary French thought’ and the ‘contemporary world’ under the common articulation of ‘the reject, as a figure thatall of us undeniably or even irreducibly assume at some point in time in our lives’ (x-xi). Goh develops and defends the claim that ‘the reject is a critical figure of thought for the contemporary world’, and therefore that one must ‘articulate it without further hesitation or reservation’ (xii). This claim is supported by a detailed study of the development of the conception of the reject, which has been, as Goh argues, ‘with philosophy right at its beginning’ (13). Because of the vast variety of thinkers cited in the work – Nancy, Derrida, Deleuze and Guattari, Cixous, Clément, Badiou, Balibar, Rancière, just to mention a few – this review will focus on Goh’s main concern in his book, which is to open up thought and existence to other forms of relations, politics, religious and human life that go beyond, if not are incompossible to, their present ‘appellations or conceptualizations’ (251). not just to elicit it [the challenge of theorising the reject today] from within safe textual boundaries and elucidate it “on paper”, but also to contextualize it amidst the irreducible and undeniable fact of existing with others in the real world […], the contextualization within bothtextual and empirical domains (24). It is here that the analysis of the reject intersects with the ‘sort of guiding thought’ that consistently leads Goh’s work towards ‘a thought “without subject”’ (16). For Goh, there is a need to abandon ‘all suppositions of the subject’ (240). This claim is supported in Chapter One, ‘Let’s Drop the Subject’, in which Goh studies the development of the conception of thesubject in twentieth-century French thought. It is the modern conception of the subject that, according to Goh, ultimately carries itself beyond itself, and thus points towards the reject as a gesture of, and for, thought. It might be helpful to look at what is implied in this history of the subject, for, besides constituting the theoretical background concerning the need for a theory of the reject, it goes directly to the heart of discussions on the subject, which, in many respects, bring along with them the effect of opacity. Let’s have a go at it. On his sea journey through the history of philosophy, Hegel exclaims: ‘Here…we are home and, like the sailor who has journeyed on the stormy sea for a long time, cry: “Land-ho!”’ It is with Descartes’s discovery of the cogito that we enter into the new philosophy of the world, an independent philosophy, according to which the becoming independent of philosophy is a becoming independent of the subject: that is, the subject that grasps itself in its reflection upon itself. Especially through Heidegger’s account of Hegel’s report on the discovery of the philosophy of the subject – the discovery of the solid ground upon which philosophy can truly settle – the resilient interpretation of the subject, understood as that which already lies before, comes to the fore in twentieth-century thought. Yet, during this same century, a critical confrontation with the philosophy of the subject has also taken place. To put it all too simply, the subject has been rejected in view of a liquidation of the subject, which in turn presupposes and affirms the very subjectivity that calls for liquidation. Drawing on the question that Nancy posed in 1986 – ‘Who comes after the subject?’ – Goh presents an ambitious attempt to explain and defend the urgency to go back to Nancy’s question and an ‘attempt at that more adequate response’ (4). Goh’s response to the promise of Nancy’s question is: the reject. As a counter-strategy to the attempt either to liquidate or to adhere to the subject, Goh argues that the reject names the opening up of a figure other than the subject, without, however, rejecting the subject. Goh’s argument about the reject assumes three constitutive turns: I). The passive rejectunderstood as the target of denigration or abandonment (7); II). The active force of the reject, which consists in rejecting the external forces that repress it (e.g. the subject). The activereject may even reject others to the degree that it is rendered a reject also by those self-same others. However, resistance to the subject is not a matter of annihilating that which is resisted, because the reject would then only repeat ‘the gesture of that which it counteracts’ (249); and III). The auto-reject: ‘the reject’s turning of the force of rejection around on itself’ (7, 249-50). With this third turn of the reject in mind, Goh takes the necessary precaution of not allowing itself to ‘overassert itself; instead, it will be more critical to put in effect the third turn of theauto-reject’ (25-26). For Goh, this leads to an ethical dimension of the singular question of thereject: the other, before the auto-reject, is always free to depart, always free even to not arrive before the auto-reject. This is an ethics that ‘always modulates itself, at every instant, as different beings come into contact with one another at each time’ (26, 224). Goh’s impassioned defence of a figure of thought that comes after the subject, rejecting any presupposed structure of subjectivity, is a welcome addition to the literature, which often seems, as Goh convincingly argues, to have forgotten the problem of the reject, traceable throughout the course of philosophy’s histories. What is more, by implying that a ‘theory of thereject cannot rest content to be just a matter of textual elucidation: it must go beyond conceptual rhetoric and suggest at least potential empirical applications’ (97), Goh, for example, attends to a case analysis of the Occupy movement based on Bartleby’s dictum,‘I would prefer not to’, which, instead of knowing ‘when to walk away’ (190), occupies a space on which it grounds itself as a sovereign subject. Yet, despite his insistence on the reject as that which never ‘demands the total disclosure of the other’ (214), it remains unclear, I think, as to whether Goh’s eventual focus on the ‘need [for] a theory of the reject’ (23) might lead to a privileging of the reject, whilst downplaying other aspects of the question of the subject. This post originally appeared on the LSE Review of Books. It represents the views of the author and not those of Democratic Audit or the LSE. Please read our comments policy before posting. Bjarke Mørkøre Stigel Hansen is a PhD student in European Philosophy, European Institute at the London School of Economics and Political Science. His work explores the philosophy of Europe. He is interested in German Idealism, phenomenology and deconstruction.